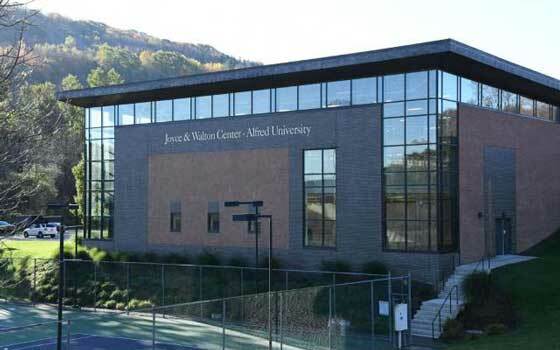 Alfred University's Joyce and Walton Family Center for Health and Wellness opened on February 17, 2014. Constructed with state funds, this 33,000-square-foot addition to McLane Center includes a 140-meter raised indoor track, an all-purpose court suitable for basketball, volleyball, badminton, soccer and other open space games, and two locker rooms with restroom facilities. A support wing located on the west end houses a multi-purpose room for activities such as yoga, Zumba, and martial arts. AU's tennis teams and softball team also conduct indoor practices in the facility. The center is open to AU students and personnel as well as community members. AU personnel and community members have access to several hours of open recreation each day. Club, intramural, and varsity teams have reserved time blocks to use the facility. University personnel and students can use their AU cards to swipe into the building. Community members can sign up to receive a card on site in the McLane Center Athletics Department Office.